quote from time to time. I know you have done a massive amount of research on your own. I was wondering about some of the unknown people in your early days. Like when you first started programming on wall street. People who shared things with you that gave incite… or steered you in the right directions knowledge wise. People who keyed you in on trading, markets and so forth. It would be interesting to hear if you could share. Alright, Nice evening to you sir. ANSWER: Life is a math equation. Life = Sum(x + y + z). 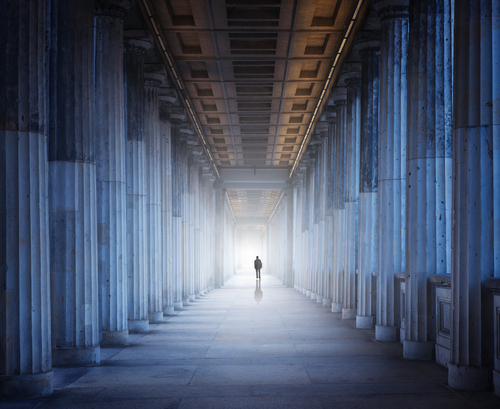 Everything we do accumulates and the sum forges our character-defining who we are. Experience = knowledge. Nobody is ever born knowing everything. We learn ONLY from our mistakes so cherish them well for they are what make us who we are. When there is nothing left to learn about this world, then it is time to leave. Never be afraid to question for unless we have questions, we will never arrive at answers. People often ask me why I am not bitter for the injustices I have fought against in New York. They have been absorbed and contribute to my understanding of life. In our natural habitat, we tend to judge others by ourselves. We need to be confronted by the opposite to understand its very nature. I have seen the corruption of the Judicial system from the inside out and am so glad I did not become a lawyer as my father wanted. You learn that there are truly evil people who know what they do is wrong, so they try to oppress and even kill those who would expose them. They deny all wrong-doing and pretend to be so upright, but someone who really is upright never pretends to be because they do not have to. The fact that they must act in this manner demonstrates that they themselves know they are evil or they would stand in the light of day. Just mind-blowing how people can act so corruptly and then sleep at night. There was one kid they were charging with conspiracy for murder because someone asked him where a person was he pointed to him and they killed him. He was not part of it nor did he know the killers. They got less time by implicating others. The government wanted the death penalty. The prosecutor refused because the kid had no priors and was 23 and he did not know the killers. He quit and the next prosecutor had no problem trying to kill this kid for a conspiracy all because they wanted to win the first death penalty case in New York City regardless of who it was they would kill. Some of the evilest people in the world go to the Justice Department. My father pushed me into computers because I was probably a natural trader which he disapproved of and I decided I did not want to become a lawyer. I was also not motivated by the education system. I suppose I began to see that those teaching did not have actual experience in what they taught. The ancient Romans had the best school system. You have the basic reading, writing, math, as well as history. However, you would decide what you wanted to do in life and left what would be called grade school to seek an apprenticeship. My father was going to take us to Europe for the summer, I believe, in 1964. I wanted to earn some money for myself and got a job in a coin/bullion store. Yes, you could buy gold before 1975 in coin form. There were countries who produced restrikes to be able to sell gold. 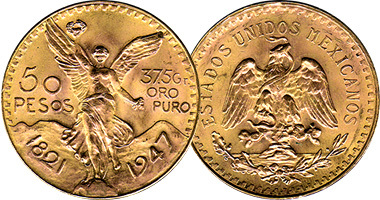 Hungary issued coins data 1908 and Mexico kept the date 1947 on 50 pesos. Gold coins were legal for “collectors” as long as they were dated 1947 or earlier. This was my introduction to world economics through money. Getting a job in a bullion store was my apprenticeship for I began to see markets and observed the daily fluctuations. 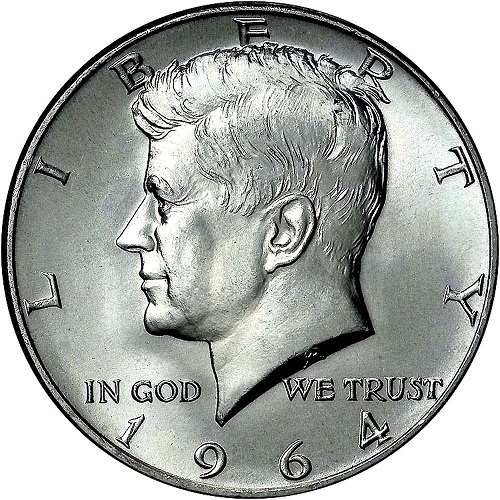 Silver was rising in price and President Kenney signed in 1963 the Executive Order 11110 on June 4th, 1963 to remove silver from the coins starting in 1965 before he was assassinated. Just about every country soon followed by 1965-1966. They two years later is when Bretton Woods began to crack in 1968 and a two-tier market in gold began – private and official. Gold began to trade in London. It didn’t trade in the USA until 1975. Going to Europe, we traveled the entire summer driving from Sweden down to Naples to visit Pompeii. I became the navigator but it also was a quick introduction to foreign exchange. We would have to exchange money at each border. I had a few 1964 Kennedy half-dollars. Whenever I would pull one out, whatever the bill was if $10 to $25, they just wanted that coin instead. It taught me early lessons about arbitrage. I remember telling my father we should have come to Europe with a bag of them and we would have paid for everything. Every door we open in life leads to another. I have never been one to be afraid of trying something new. Failure is how we learn and success is our reward. Had I not gotten a job in that coin store where I bought my first Roman coin for $10, I would not be here today writing this. That is what I mean that we are the sum of our experiences. 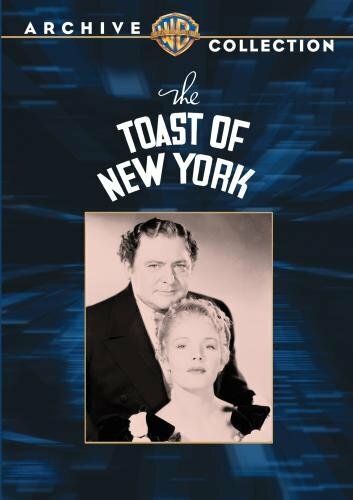 I was in history class and the high school professor brought in an old film The Toast of New York. It was a film about the Panic of 1869 and the attempt of Jim Fisk to corner the gold market. In this clip, you will see what sparked my imagination and sense of curiosity given my exposure to reality by working. Jim Fisk is at the ticker-tape, and he then turns to his girlfriend and quotes gold at $162. Now I knew from working that gold was $35. Suddenly, I was confronted with an anomaly. I was being taught that everything was linear. So how was it possible that gold could be $162 in 1869 and $35 today in the 1960s? At first, I assumed it was just a movie. But it bothered me. There was a QUESTION in the back of my mind that would not be answered. I went to the library and looked up the price of gold in the microfilm copies of The New York Times. There it was, the quote, $162. It was real. It profoundly shook my belief system to the very foundation. Countless questions were running around my mind like a pack of wild animals being chasing a rabbit. I began to ask questions in economics class. The answer was even more disturbing. Well, there was this thing that they once called the business cycle, but the government has eradicated that I was told thanks to Keynes. I was told it was foolish to think the economy can be forecast. The government was smoothing it out to create full employment 100% of the time. It was a real bull market in everything going into 1966. Rare coins peaked. 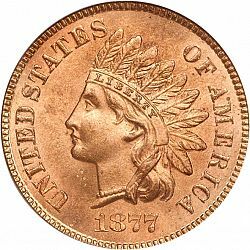 I remember an 1877 Indian Head Penny was sold for $700. It crashed by 50% in months and never saw that price again for at least a decade. Pennies were the hot thing back then. I was buying and selling and it taught me how to trade. I made so much money my father convinced me to invest in mutual funds. I did, and then the stock market collapsed and the mutual fund dropped from $54 to about $5. I asked my father if this was the way conservative people made money? My speculating in commodities was much more profitable than stocks I knew nothing about at that time. I began to notice that there were certain things that were hot and others that were cold. The pennies were soaring but not ancient coins or many other denominations of American coins. Collectibles market crashed with the 1966 stock market crash as did mutual funds. 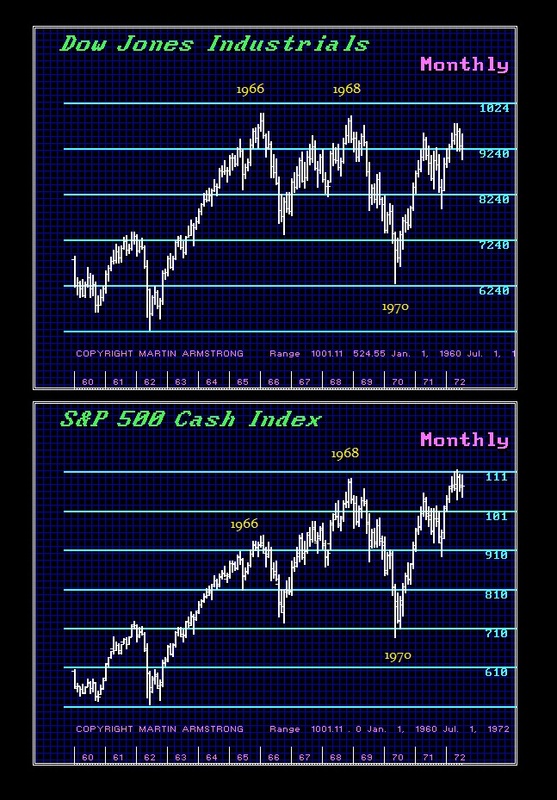 The Crash of 1966 was followed by another in 1968 when the two-tier market in gold began with the crack in Britton Woods. The real estate crashed in 1970 as well. But even more confounding, gold actually fell BELOW $35 in 1970 – the old Bretton Woods fixed rate that everyone assumed would hold. There was no mentor back then. You had to learn from observation. Bretton Woods was collapsing and nobody knew what would even happen no less forecast what would come by 1971. I was finished with high school, but the nagging questions only multiplied. Clearly, there was some sort of a cycle. It did not matter if it was stocks, bonds, coins, collectibles, foreign exchange, or real estate. It was obvious that everything went through the same boom and bust cycle. I was doing my own research now in the Firestone Library at Princeton University. I was searching old newspapers, looking for previous prices of booms and busts that I had been confronted with in gold. 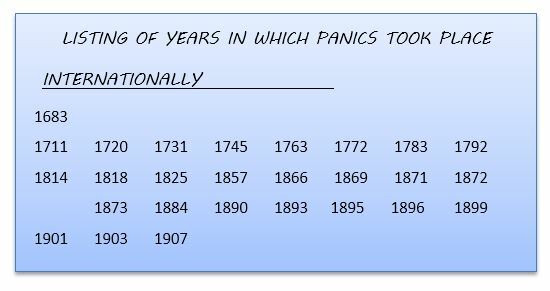 That’s when I stumbled upon an article that listed previous panics between 1683 and 1907. This was an old article published even before the 1929 Great Depression. That is why the list stopped with 1907. 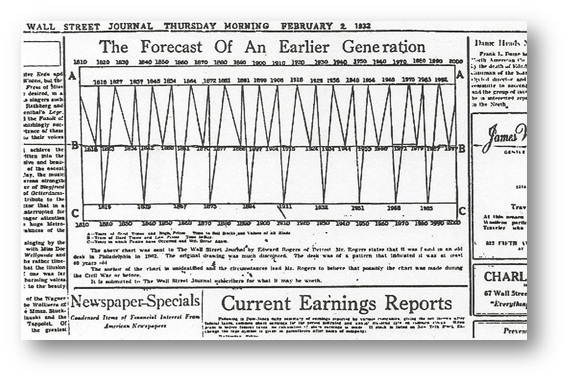 It was even pre-World War I.
That’s when I also stumbled upon this illustration of a business cycle published on February 2nd, 1932 in The Wall Street Journal. I took the list I found that covered a span of 224 years and I divided it by the 26 events which yielded the 8.6-year average. I began to test through history which I knew well. The rest is history itself as they say (see wave structure). So no, there was nobody to talk to back then. You had to learn everything on your own. It was not until the Crash of 1974 that Paul Volcker was inspired to call it “The Rediscovery of the Business Cycle” because they did not even teach the existence of such a cycle. It was supposed to have been conquered by the government with Keynesianism. It was an age of rediscovery indeed. There was no place to go. Gold futures began in 1975, bonds 1977 and S&P 500 futures in 1985. There were no trading clubs. I was on my own.